Now that I’ve gotten back into following The Curly Girl Method with renewed vigour, I’m really noticing that I’m going through a good amount of the products I’ve been hoarding. 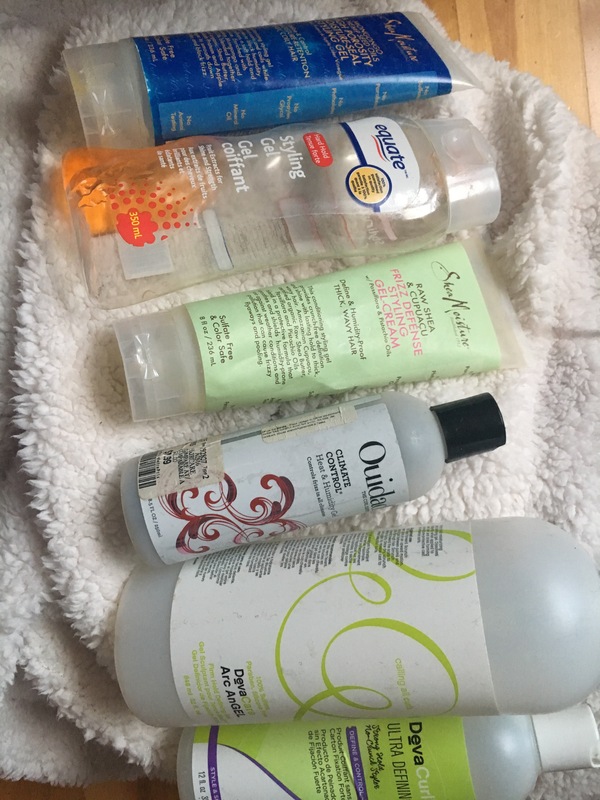 My bag of empty products has rapidly been filling with hair products and as a true product junkie, I have lots of thoughts to share on them. Today, I’m sharing my thoughts on the gels that I have finished up. This is going to seem like a lot of product but in all honesty, my hair eats up gel and I need lots of it to have consistently defined hair. Otherwise, my hair willjust wilt, tangle and frizz. It’s worth noting that I have a ton of fine long hair, a mix of waves and some curls in terms of texture and hair that is quite porous. This gel is my absolute favourite in the humid summer because my hair frizzes out and wilts overnight and throughout the day the least with this gel. It provides great almost firm hold and isn’t particularly drying, crunchy or heavy for that level of hold but doesn’t give my curls the enhancing boost that Ultra Defining Gel does, especially in the cooler months when my curls need more encouragement. It’s a gel heavy in glycerin but it has nowhere near the amount of protein that the other gels in the line have, so it could be very good for hair that doesn’t love protein as much as mine does. I also frustratingly find that by the time I get towards the end of these large bottles, the texture of the gel starts to change and doesn’t seem to work quite so well. As it gets closer to the summer, I want to experiment with this one again. Probably because my hair absorbs everything and seems to resist forming a protective cast like nothing else, I find that I need a good amount of this gel but I also find that my waves and curls are a bit bouncier and more spirally with this gel, especially in the cooler months when my curls tend to lie flat and wilt. It’s a touch more than medium hold and can enhance and tighten up my curls, without being drying or weighing my hair down. I wish I didn’t have to use quite so much and that it gave slightly more hold on my temperamental hair that resists looking decent by the next day. It has loads of protein which my fine porous hair loves and also is glycerin heavy. It’s my favourite of the gels in the cooler months, I reckon. I think this was actually the product that started my love of traditional gels, back when I tried it years ago. I found it for a great price at Winners and tried it again and remember why I liked it. My gripe with this product is that it’s expensive at full retail price, especially because the hold is on the lower-end of medium and in order to get good results, I have to use so much of this gel. It’s really hydrating and helps my curls to clump nicely but doesn’t quite have the structure and enhancement of the Deva gels. I will note that I don’t experience much frizz with this one and that I’ve had good hair days with it. This gel might be better for those who prefer a lighter hold or with a tighter curl pattern. I do love the fresh and clean scent. Glycerin is towards the bottom of the ingredient list with this one and protein appears near there as well. I didn’t love this gel but that was because of first time buyer error mainly. I bought the gel along with the other products in the high porosity line that I adore because I felt some sort of need to complete the collection. It didn’t work for me as a harder hold gel because it has a soft hold, as it’s marketed to. It’s smoothing and moisturizing but lacks the hard hold that I need. I do think those with tighter curls would like this if they want moisture and softer hair. I didn’t mind it as a refresher on damp hair. It has glycerin, shea butter, aloe and a variety of oils. I bought this cream gel because it was designed for a wavier texture and remembered liking cream gel products in the past, but it wasn’t right for me either as a main styler. I think it might work for those with coarser hair textures but not for my finer hair as a holding product. It didn’t weigh my hair down and it did add moisture but I didn’t find that it had much for hold or curl clumping ability. I did find it worked quite well on damp hair to refresh because it added that moisture and enough hold to bring curls back to life. I purchased this affordable gel after seeing that its ingredients were similar to the cheapie gels available in the United States that those who follow the Curly Girl Method seem to adore such as the LA Looks offerings. The hold was moderate and it was somewhat curl clumping but I wasn’t blown away by this one. I did get fairly good results using this gel in combination with another cream or enhancing product but I think that the Sport Gel variation was my favourite out of the three varieties I tried. It’s glycerin free and contains a small amount of protein.